– Arcane Revelry has partnered with dining experience platform, Feastly, and national CBD brand, Select CBD, to host Feastly Portland’s first CBD-Infused Brunch Series on Saturday, November 11th from 11am to 2pm in Portland, Oregon. – At the event, Select CBD will announce and present a brand new hemp-derived, essential oil infused CBD product. 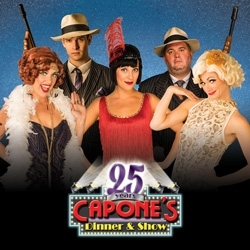 – For a ticket price of $55, guests will indulge in a CBD-infused gourmet brunch with Select CBD, sip on CBD-infused cocktails, learn about the benefits of CBD and receive a brand new product from the Select CBD line. Arcane Revelry and dining experience platform, Feastly, are hosting a CBD-infused brunch series to celebrate a brand new Select CBD product on Saturday, November 11 from 11am to 2pm PT in Portland, Oregon. 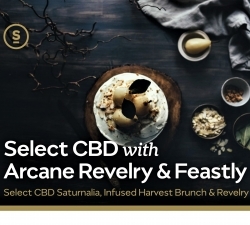 At Select CBD Saturnalia, Infused Harvest Brunch & Revelry, Select CBD will announce a brand new product in its line of essential oil infused, hemp-derived CBD. Ages 21+ are invited to attend this Feastly PDX and Select CBD first, featuring CBD-infused haute cuisine prepared by Chef Harol Mendieta and CBD-infused cocktails by Coalition Brewing, Indio Spirits/Rose City Distilling, and Messina Bitters. Arcane Revelry events sell out, and this event will be capped at 40 attendees. Those who have never experienced a CBD infused meal can expect to be educated by the experts at Arcane Revelry and Select CBD. Arcane Revelry provides guests with a safe and private venue to connect with members of our community, educate and learn from each other, and normalize cannabis and hemp consumption. Select CBD representatives will also be onsite to educate guests on CBD, a compound that interacts with the body’s endocannabanoid system, which regulates pain sensation, mood, the immune system, memory and countless other important physical functions. Because these products are hemp-derived, they contain zero THC, with no psychoactive buzz effect that you would expect from most cannabis. Guests can expect several satiating CBD-infused courses that will be paired with complimentary herb & fruit infused mimosas. Local music will help guests experience the full, relaxing effect of CBD, along with an awesome selection of signature craft cocktails, beer and wine for purchase. Reserve a spot now for Arcane Revelry and Select Oil’s first CBD-infused brunch! Purchase tickets here. Cannabis Culture by Invitation Only. Arcane Revelry has made its debut in Portland, OR by launching an exclusive cannabis pop-up dinner series. These exciting events bring together community members, entrepreneurs, thought leaders, innovators, and forward thinkers that all share a love of cannabis culture and high-spirited social engagement. Arcane Revelry experiences combine unique private venues, delicious meals crafted by gourmet chefs, industry sponsors, amazing people, and new friends. Each event features a curation of many great products for our guests to enjoy and sample.